“Character may be manifested in the great moments, but it is made in the small ones." If life can be imagined as a tapestry made up of the many threads of life experiences, then OLLI at Duke’s own Pete Selleck’s life is represented in a tapestry of many colors, textures, patterns, and designs. I met him on a cold and gray January day at JRC. Many of you know and respect Pete already but for me, at first glance, he seemed a pleasant, kind, grandfatherly type and I was relieved that he seemed amenable to the meeting. It wasn’t long into the interview that I realized this man has been logistically and strategically important to the history of our nation for the past sixty years, a man behind the scene who made things happen. His life’s tapestry is indeed colorful and intricate. He was born on December 23, 1930 in Washington D.C., and christened Clyde Andrew Selleck, Jr. The name seemed a bit long and heavy for a wee baby; his mother called him “Pete,” a nickname that has persisted throughout his life. Pete was the son of an Army officer and much of his own life was spent in the military, from his early years as a cadet at West Point to command of Army units and work with the Army Corps of Engineers. Just after graduation he served in the war in Korea commanding a combat engineer company. He later attended graduate school at Princeton receiving a master’s degree in civil engineering and later studied nuclear engineering at Northwestern and Oak Ridge National Laboratory. 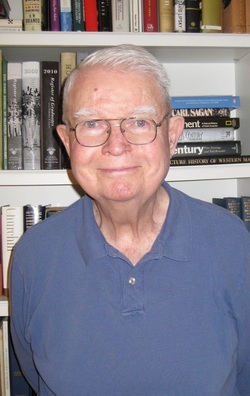 He analyzed nuclear power plants for the Army; developed computer systems in an Army supply agency in France; commanded a combat engineer battalion in Vietnam where he restored the principal highway in the Mekong Delta after Tet in 1968; served on the Army Staff and as the Executive Director of Civil Works in the Office of the Chief of Engineers; commanded the Philadelphia District and Missouri River Division of the Corps of Engineers, managing many civil works and military construction projects, and taught on the faculty of the Army War College. He’s led a diverse life full of challenges, interesting people, historic events, and played an important role in 20th century progress. Pete has been committed to OLLI at Duke since 1992 when the organization was named DILR (Duke Institute for Learning in Retirement.) He served as the president of DILR and on various committees including his current position on the curriculum committee. Pete has taught more than fifty courses, earning him the Bill Wright Award and a lifetime membership with OLLI. His positive contributions, leadership, and energy have been felt at every level of the organization. He has decided to update his energy course. There have been significant changes in recent years, particularly with the increased supply of oil and natural gas and there is a pressing need to revise the policies of dealing with all sources and uses of energy. The next few months should see some new initiatives or at least the alteration of our more traditional ways of balancing our economic needs with other pressing factors including the environment. The subject is well worth some careful review. Perhaps the course will be another colorful patch to Pete’s tapestry? Whatever he decides to do it will be interesting and colorful.